Bladder stones are small mineral deposits that can form in the bladder. In most cases bladder stones develop when the urine becomes very concentrated or when one is dehydrated. This allows for minerals, such as calcium or magnesium salts, to crystallize and form stones. 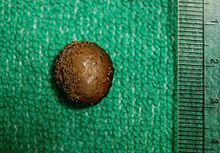 Bladder stones vary in number, size and consistency. In some cases bladder stones do not cause any symptoms and are discovered as an incidental finding on a plain radiograph. However, when symptoms do occur, these may include severe lower abdominal and back pain, difficult urination, frequent urination at night, fever, painful urination and blood in the urine. The majority of individuals who are symptomatic will complain of pain which comes in waves. The pain may also be associated with nausea, vomiting and chills. Bladder stones vary in their size, shape and texture- some are small, hard and smooth whereas others are huge, spiked and very soft. One can have one or multiple stones. Bladder stones are somewhat more common in men who have prostate enlargement. The large prostate presses on the urethra and makes it difficult to pass urine. Over time, stagnant urine collects in the bladder and minerals like calcium start to precipitate. Other individuals who develop bladder stones include those who have had spinal cord injury, paralysis, or some type of nerve damage. When nerves to the back are damaged, the bladder cannot empty, resulting in stagnant urine.